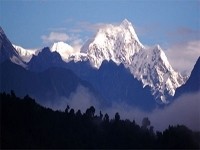 On the evening of September 18th, the Himalayan region was hit by an earthquake measuring 6.9 on the Richter Scale. 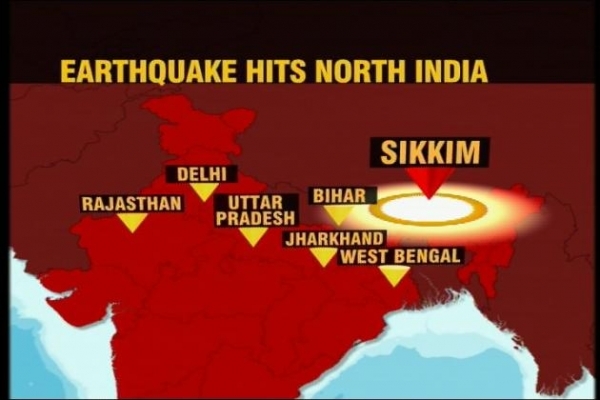 The epicentre was in Sikkim and at least 63 people have been killed there and in the surrounding areas of Bihar, West Bengal, Nepal and Tibet. Hundreds more have been injured by the subsequent mudslides and falling debris and the death and injury toll is rising as rescue workers continue to use shovels and bare hands to pull bodies from destroyed buildings. Many buildings in and around Gangtok, the capital of Sikkim, have collapsed and around 85 per cent of structures and houses have developed cracks. It is estimated that 100,000 homes in the Himalayan region are affected. Areas in north Sikkim have been cut off from the rest of the country as roads are blocked and communication lines damaged by the earthquake. Click here for live webcast of Throma Nagmo retreat with His Holiness Gyalwang Drukpa and His Eminence Kyabje Khamtrul Rinpoche, broadcast live from Kathmandu, from October 18th to 25th. Video on demand of previous sessions also available. Drukpa UK is delighted to be one of the 108 sponsors of the Vajra Wheel project which has been recently launched by His Holiness Gyalwang Drukpa. This is a wonderful opportunity for us all to participate in this extremely auspicious project If you would like to contribute towards the $10,000 (aproximately £6,000) required to meet our target please use this link to make an online donation (via paypal). 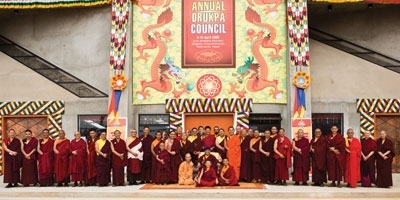 In accordance with the wish of His Holiness Gyalwang Drukpa, the Third Council of the Drupka Lineage will take place this year from August 20th to 29th at Shey (Ladakh) at Naropa Palace, very near Druk White Lotus school. Ladakh, also called “Little Tibet” is a land that is particularly blessed by the presence of numerous Great Drukpa Masters of the past who went there from Tibet, such as the great yogi Taktsang Repa who founded Hemis Monastery, Gyalwa Gotsangpa, as well as the incarnations of the 7th and 8th Gyalwang Drukpa. 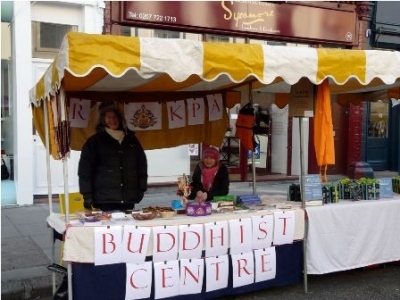 On November 28th we took a stall at Primrose Hill Fair to promote our centre and activities. In spite of the cold weather we had lots of of interest from the local community. 10.10.10 or 10th October 2010, a day occuring once in every thousand years, was a day to remember by most Ladakhis and the international volunteers. A Guinness World Record (GWR) for "Most Trees Planted Simultaneously" was broken or rather, a new record was set! The feat was achieved in half the stipulated time by 9,313 people who came from villages across Ladakh, and different religious and cultural backgrounds. We broke the record set in Peru earlier this year, where 27,166 saplings had been planted by 8,000 participants in an hour. All this week we willl be running special Shabten (Long Life prayer) sessions at the London centre to coincide with the Long Life ceremonies for His Holiness the Gyawang Drukpa, which are taking place in Darjeeling (see calendar on the right for details). 'As some of you may already know or have heard, from a traditional Tibetan viewpoint, the next 4 years are considered ‘obstacle’ years for His Holiness from the astrological point of view. 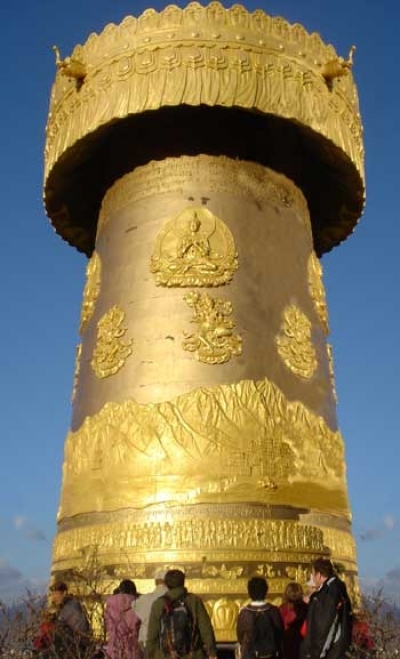 Though Buddha himself like His Holiness are beyond the dualistic concepts of obstacles it is extremely important for us lay devotees, as well as nuns and monks living in the samsara with dualistic concepts to perform spiritual activities dedicated for the longevity of His Holiness Gyalwang Drukpa. These merits should also be dedicated for His Holiness Je Khenpo Jigme Choedra, His Eminence Bairo Rinpoche and Mayoumla and for all the great masters whose mere presence, if prolonged for even a second, can greatly benefit numerous seen and unseen beings'. Live to Love (L2L) kicked off its Tree Planting Drive on September 12, 2010 for a greener Commonwealth Games Delhi 2010, when monks, nuns and members of the Young Drukpa Association of the Drukpa Lineage planted 1,016 trees near the Hemis monastery in Ladakh. The number 1,016 was chosen as it marks the birth year of Drukpa lineage's Indian guru, Naropa, as a support to Live to Love initiatives. Honorable Minister of Communiciation and Information Technology Shri Sachin Pilot and delegates from the Commonwealth Games were present to officiate the event. This Tree Planting Drive will culminate during the Commonwealth Games 2010 when, on October 10, 2010, L2L will launch another bigger scale tree planting in Ladakh with an attempt to set a world record of planting the maximum number of trees in an hour. 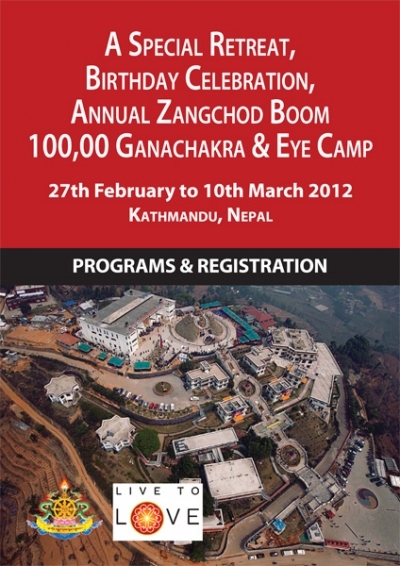 Please visit http://www.drukpa-hk.org/news-event/hong-kong;news/id/388 to find out how you can participate. Join the walking pilgrimage to visit the holy sites in Sikkim, blessed by Guru Padmasambhava, and celebrate Christmas with His Holiness and his spiritual entourage with strikingly beautiful valleys, passes and villages as backdrops. Just like the ancient times when the Buddha walked with his disciples and taught them through his physical actions and verbal expressions, His Holiness and his spiritual sons and daughters will help us relive the ancient traditions of spirituality as well as connect this ancient wisdom with our modern life. A series of cloudbursts on August 5th rocked the peace of Ladakh and brought a state of devastation never before experienced by anyone in this remote Himalayan region. Ladakh is described as 'my homeland' by His Holiness Gyalwang Drukpa and Drukpa UK, in conjunction with Live To Love UK, has been running an appeal for funds to help to Bring the Smiles Back to Ladakh. If you have been touched by these images and stories and would like to contribute to the Ladakh Disaster Humanitarian appeal we urge you to visit our How To Donate page to make a donation via Paypal, using the Live To Love donation buttons. Alternatively, you can send a cheque to Drukpa UK (Ladakh Disaster Appeal), 114 Harvist Road, London NW6 6HJ. So far we have sent £9,000 to the Live to Love Charitable Foundation in Hong Kong for immediate relief purposes and we would like to express our heartfelt thanks to everybody who has contributed so far. We are delighted to announce that the Venerable Drubpon Ngawang will be coming to London to give P'owa teachings and practice at the Drukpa London centre, from May 30th to June 1st. Live to Love UK was officially launched on Friday 17th September at a gala dinner in the gracious surroundings of the Royal Society in London. Viscount and Viscountess Cowdray, film and TV stars Aamir Khan , Michelle Yeoh and Ruby Wax, Take That's Mark Owen and Jason Orange and film directors Kiran Rao, Ed Bye and Glen Goei were joined by some of London's foremost entrepreneurs for the first event of L2L UK, which was also a fundraiser to restore the recently devastated Druk White Lotus School.